Hooray! I am using Microsoft Word! - Download the Microsoft Word. - Move or unpack the package to ~/Desktop/word_package/ with your Archive Manager, that package is a PKZIP+SFX. If your Archive Manager can't unpack it, you can run it in DosBox to unpack. - Install DosBox. 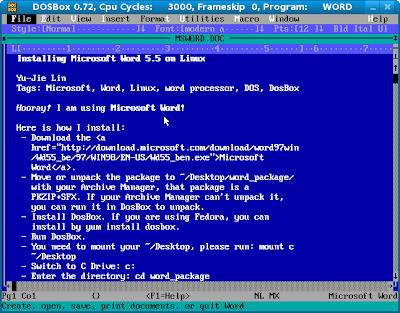 If you are using Fedora, you can install by yum install dosbox. - Then run setup.exe and follow the instruction on screen. I didn't update any system things while installation. If your arrow keys do not work, please read the next; if they do work, skip next. - After you done installation, the Word should be at C:\WORD. Switch to it cd C:\WORD and run word. I got the link via CLICK and read the resolution of keycode issue in this thread. This post is written in Microsoft Word 5.5 with DosBox on Fedora 10, saved as RTF, uploaded to Google Docs, then copy-and-paste to Blogspot. However, some styles are applied on Google Docs for readability. You can download the original DOC and RTF.